What you are now starting to experience is 'year zero.' It's not some kind of gimmick to get you to buy a record – it is the art form . . . and we're just getting started. Let’s Build a Dystopian Future! In the spring of 2007, Trent Reznor, lead singer of Nine Inch Nails (NIN), contacted 42Entertainment to collaborate on his upcoming album Year Zero. He wanted us to build the world he envisioned when creating the album; a dystopian future where the government rules with a heavy hand, drugs are added to the water supply to pacify the citizens, and a resistance is forming to combat this reality. We pitched a massive alternate reality game involving over 40 websites, puzzles, and live events as a way to build out this shared vision. In this future, 2022 to be exact, someone’s figured out a rudimentary version of time travel but all they can send to the past is data. They’ve snapped a 1/10,000 second snapshot of all data and sent it back in time to 2007 where the beginnings of the resistance are rebuilding it and releasing it for people to discover. The result of pushing all this data back in time is the rebuilt websites are covered in “digital noise”. 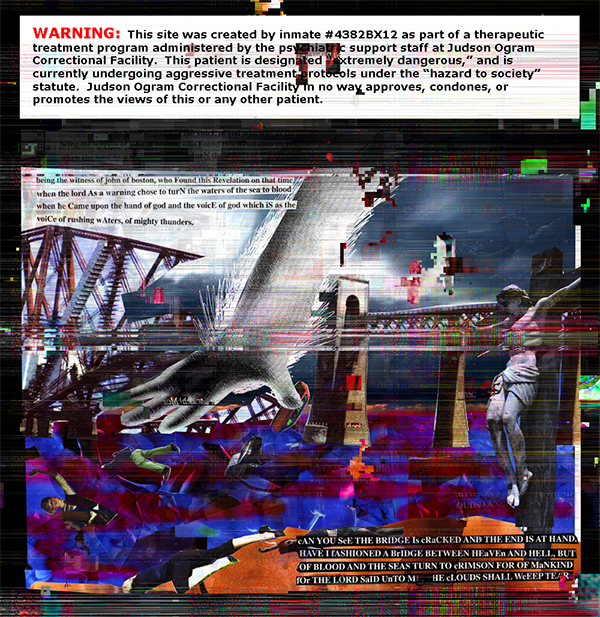 A collage I created in character as an asylum patient, posted to one of our sites with digital noise applied. My task was to design all the websites and the digital noise that would be applied to them. To start, I set out working with photoshop to create a file that any site design could be added to and have this noise applied in a random but controlled way, in under five minutes, to make each site feel unique yet similar. Moving noise layers on a completed Photoshop file. Once I’d run through that simple flow it became clear exactly what I was designing. Some sites, like the site for the First Evangelical Church of Plano, were core to the experience and required longer discussions with the writers and creatives designing the world to get a clearer picture of exactly what we were trying to communicate. In this dystopian future churches are state run. One of my fondest memories of this experience was designing sites that weren’t aesthetically pleasing or threw a few design rules out the window. The second step in my flow, assessing the site creators design skills, sometimes lead to interesting discoveries; like that the conspiracy theorist designing a site would favor using Impact as his typeface since it’s bold and will grab users’ attentions. Or that the company contracted to design the prison security interface skimped on design and had their developers design the interface. Discoveries like this lead to some fun challenges fueling design directions I wouldn’t have otherwise pursued. An interactive site that allowed users to explore a live prison surveillance feed. One of the key elements of an alternate reality game is monitoring the fans and making sure the experience is going as planned. We watched them intently on their fan site echoingthesound.org and discovered they were engaging at unheard of levels; fans would spend hours a day exploring our content, digging through code, decompiling our Flash files, running new NIN music through waveform visualizers, all hoping to be the person to discover the next piece of the puzzle. We’d created a very effective variable reward within a hooked loop. A simple hooked loop that kept players coming back for more.